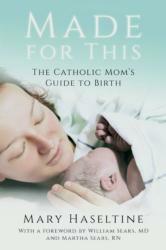 In her debut book titled “Made for This: The Catholic Mom’s Guide to Birth,” Haseltine draws on St. John Paul II’s theology of the body to show that childbirth is an essential part of who God created women to be, body and soul. With real-life stories from many moms and practical tips — including preparing for birth, making informed choices, helping fathers embrace their role in the birth room, and encountering the work of labor — the book published by Our Sunday Visitor is a guide for navigating the physical and spiritual dimensions of pregnancy and birth. Expectant mothers will find the tools they need to approach birth as a gift, and to recognize God’s work in the experience. Haseltine said she had never planned on writing a book, but from the start of her motherhood and after she gave birth to her first son, she knew there needed to be a book like this to share the experience. “God made it very clear to me about two years ago that this was what he was asking of me,” she said in an interview with Rhode Island Catholic, newspaper of the Providence Diocese. “There are a lot of secular books out there on birth, many of them great, but there hasn’t up until this point been a book about childbirth that approaches it from a truly whole-person perspective — body, mind, heart and soul. She added that there are so many choices when it comes to birth and unfortunately in the United States, a lot of the common protocol and procedures before and during birth are not truly evidence-based and do not respect the dignity of the mother and baby. “Made for This” already has had an impact on women and families, according to the author. It is currently featured in the top 20 new releases for books written by Christian women. “So many have written to me or mentioned how they wish this book had been around for their first births, whether that was just a short time or decades ago,” Haseltine said. “People have been really surprised with just how comprehensive the information is. As she prepared the book, she depended on the intercession of Mary, she noted. Kilgus is assistant editor of Rhode Island Catholic, newspaper of the Diocese of Providence.